A joint-statement released by the US and Chinese government has calmed the stormy waters but vague promises, imprecise objectives and notable omissions have opened the door for criticism. The statement which you can see below (courtesy of The Washington Post) is what you would expect from two governments which are trying to calm tensions, but seemingly haven’t made any progress whatsoever. There is a vague commitment from the Chinese government to increase the flow of American goods and services into the country, but the absence of any details is perhaps more notable than anything else. What the statement seems to be missing is details on how much more China would purchase, whether there are any timescales or milestones, if the US would back down on the tariffs, remove the penalties imposed on steel and aluminium, or if there have been any developments to save the endangered ZTE business. The overall objective here is to address the trade deficit the US faces. 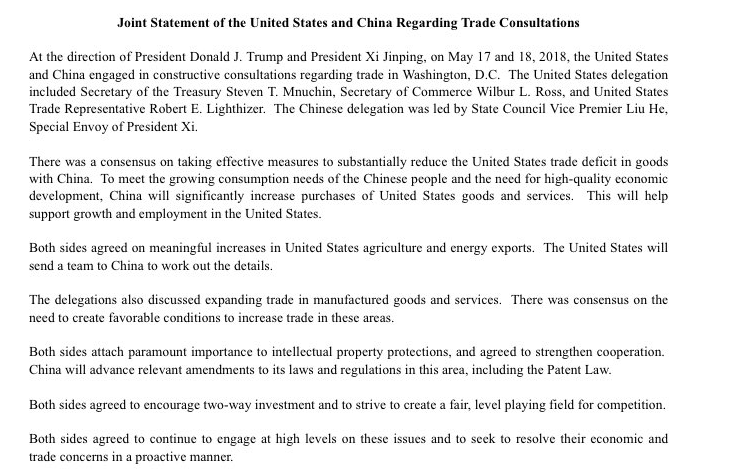 While there have been vague promises, but nothing put down on paper as of yet, to increase Chinese consumption of US goods and services by $200 billion, there is still some way to go in reversing the $335 billion deficit if President Trump is to stay true to his word. Unfortunately the telecoms and technology industry has seemingly become a pawn in the political game of chess which is beginning to unfold. Some sceptics might have come to the conclusion the Chinese regulator was blocking the Qualcomm acquisition of NXP as a power play as the two nations jostle for control of the digital economy, while other might assume the ZTE disaster was a retaliation from the US. The absence of any comments regarding the ZTE saga perhaps indicates the US government is keeping this trump card in its deck for the moment. Trump might have urged the Department of Commerce to find a solution to keep ZTE in business, but the omission is a worrying sign. While this might look like a frustrating outcome, at least it creates a brief moment to breathe. The prospect of trade war between the two nations seemed to be inevitable, though hitting the pause button is a good sign, allowing the opportunity for external influences to make a mark on the saga. Tariffs and trade wars results in positive outcomes for very few people, at least now there is the opportunity for level-headed parties to express their opinions. For the moment the world might have to wait and see. Commerce Secretary Wilbur Ross will be leading a team of representatives for meetings in China next over the course of the next week, which could prove to be a timely factor. The public consultation for US tariffs on the import of Chinese goods is set to end this week, meaning a brand new chapter in the rising tensions tale. There has been little comment regarding the current state-of-play here, placing increased emphasis on Ross’ meetings. Both sides are seemingly calm at the moment, but this might not last long. Douglas Irwin, a trade economist at Dartmouth College, commented on twitter he has seen little evidence of a Trump trade strategy as of yet. What happens next in this saga is anyone’s guess.